The Northern Indiana Commuter Transportation District, operator of the South Shore Line railroad, is requesting federal dollars for the West Lake Corridor Project. The Northern Indiana Commuter Transportation District, operator of the South Shore Line railroad, has requested the West Lake Corridor Project be included in the New Starts Engineering phase of the Federal Transit Administration’s Capital Investment Grant. NICTD said its request was made in partnership with the Northwest Indiana Regional Development Authority and the Indiana Finance Authority, the project’s financial partners. The project’s request for federal support in recent days also received backing from U.S. Senators Joe Donnelly, D-Indiana and Todd Young, R-Indiana, and U.S. Rep. Pete Visclosky, D-Gary, who jointly sent a letter of support to the FTA. The West Lake Corridor Project is an 8-mile extension of the South Shore Line that will provide new passenger rail service in Hammond, Munster, and Dyer. 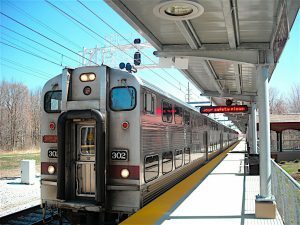 Trains on the new branch line would connect with the existing South Shore Line in north Hammond and ultimately with the Metra Electric District line, with a final stop at Millennium Station in downtown Chicago. Noland said a decision on the request will come sometime next year but didn’t offer a specific month. NICTD and the RDA will continue working with state and federal authorities on funding for the second major commuter rail expansion project in the Region, fully double tracking the existing South Shore Line from Gary to Michigan City. Combined, West Lake and double tracking are projected to attract approximately $2.3 billion in private investment to Northwest Indiana, and result in an estimated 5,700 new jobs and $3 billion in economic impact by 2048, according to project supporters. Donnelly said the South Shore West Lake expansion will be a great improvement for the Region’s infrastructure, creating new transportation options for residents and supporting continued economic growth. Young said the South Shore West Lake expansion project is important for both jobs and infrastructure development in Northwest Indiana. “I am delighted this project progressed to this critical juncture in FTA’s review process and look forward to continuing my steadfast advocacy for this crucial transit project alongside Governor Holcomb, Representative Visclosky, Senator Donnelly, the RDA, and NICTD,” Young said. Visclosky said this is the next step in creating new jobs and economic activity in Northwest Indiana.